A Gorgeous Glow from Global Goddess Beauty. Tis' the time of year for glowing like a goddess, no? Shalini Vadhera, the goddess behind Global Goddess Beauty has created some of the most gorgeous beauties to help us glow - in the subtle way we want. 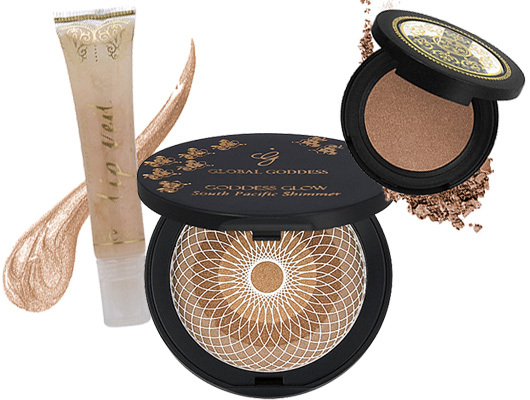 Goddess Glow Bronzing Powder ($32) - This powder is so soft and silky, leaving only the most beautiful bronzed glow with a hint of shimmer to the skin. I Divine Eyeshadow with White Tea ($18) - These subtle shimmery shades glow on and stay on. They are full of pigment offering the perfect color and again, the perfect glow we want. I especially like the anti-aging benefit I get while using a shadow too, as these beauties are infused with White Tea, one of the most powerful anti-oxidants. Darjeeling and Kumaon are both my favorites, especially for the summer. Beautyfix 2 subscribers are loving these shadows too. One shade comes in this quarters edition, which I hear will only be available for about another month, so if you want to get your Beautyfix on, do it now. Moroccan Mystique Lip Veil ($16) - These glossy and glowy lip glosses are each equally gorgeous. Each of the shades will add the perfect glow to finish off your look. Squeeze it on and glow, glow, glow. Pictured above is Sand Storm which just so happens to be my fave. Shop online at GlobalGoddessBeauty or at select stores which you can locate using their store locator guide.